Olive's fifth grade class is having a variety show, and all of Olive's friends seem to have put groups together. There's an instrumental act, martial arts, cheer, and singing, but no one asks Olive if she wants to be part of a group. She isn't happy and sulks a bit, leading her mother to ask if she should call some of the kids' parents and ask if Olive can join. This is, of course, not what Olive has in mind as she fantasizes about being with the various groups. Her hip, dyed-hair aunt offers to let her visit and hang out, eating Chinese take away and watching videotapes of female comics from the 1970s and plants the idea that Olive could be the host of the variety show. This is a fairly good solution, even if Olive's mother is less than thrilled that the aunt is forcing her "beat of your own drum" philosophy on Olive. When some friends ask Olive to be part of their group, she feels bad about saying no, but doesn't explain her plan, leading to some ill feelings. In the end, everything works out, Olive is allowed to be the host and feels better about her place in society. 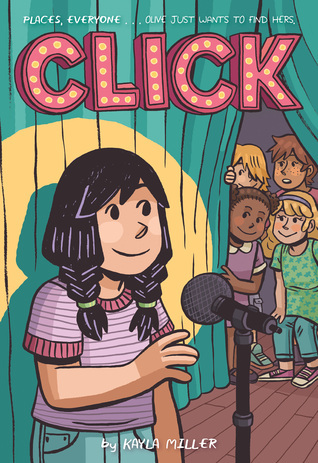 Strengths: This has a very pleasing, contemporary color palette and a style of illustration similar enough to Telgemeier, Jamieson, and Holms that every middle school and elementary library should break down and buy two copies, because one will surely be "lost" by the end of the year. The story has a little bit of girl-power and is easy to understand. This is less message-y and has about as many words as Telgemeier. Weaknesses: The noses are a little odd, but not as bad as Ignatow's. The lack of words resulted in what came across as a lot of sulking by Olive, which I found a bit boring. I was disappointed that actual women comics weren't used as examples by the aunt, but then I'm not sure that there were that many in real life. Would have been more instructive to use actual people and shows. What I really think: Definitely purchasing, but not my personal favorite. I'm not a fan of graphic novels in general, especially since I often doubt students actually read any of the words. I like the Holm's Sunny Side Up-- a bit more fun than Telgemeier (whose upcoming book, Guts, is about a girl who suffers anxiety induced gastric upset), but with serious issues explained without the detail of Jamieson's work (which would be easier to understand as tradition novels). This is a great collection of variations on fairy tales, right up there with Vande Velde's The Rumplestiltskin Problem (2000). McKay takes classic tales and puts a fresh new spin on them, but still keeps the core of the original. The problem is that I don't need ANY fairy tale books anymore. For years, our sixth grade language arts classes did a project where they took a fairy tale from one country and reset it in a country on another continent. My daughter took the Clever Gretchen tale and set it in Morocco. The students had to study the new country and include certain details in their retelling. It was quite fun, and there was a day about six years ago where every single fairy tale book on my shelves got checked out. Every single one. The project isn't done now; the teachers who loved the project retired, standards changed. Still, it's a project that I miss. This book would have enjoyed a lot of circulation in the wake of that project, as children realized either that they loved fairy tales as a child or had not read enough of them. Someone would actually read the big, red, rebound volume of Grimms' tales. But not anymore. I even weeded the Robin McKinley Beauty and Rose Daughter because they hadn't left the shelf in eight years. 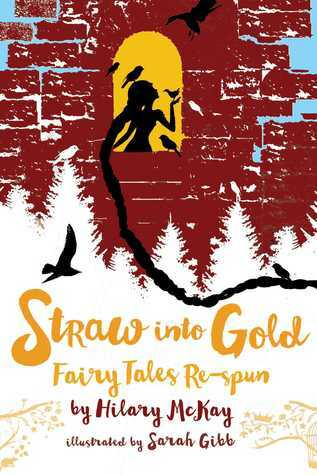 Straw Into Gold is a great book. I just don't see it circulating in my library.